Installing Windows and finding all the correct drivers can be difficult on a laptop. If you use the wrong drivers when you install Windows, components on your laptop may not work right, may work slower or may not work at all. When we install Windows on a laptop we make sure we use the most up to date drivers available for your device. Furthermore we can also backup all of your old data and return the backup in the new Windows installation. We will also install any other software that you have a license for. We are a true nationwide provider Windows Installation on Laptop, Laptop professional repair services as well as iPhone repair. Besides repairs at our Laptop repair services, Laptop repair, PC Computers and laptop repair service center in Bellville Cape town, we have installed windows on Laptops for customers all over South Africa including Johannesburg, Pretoria, Durban, Kimberly, Bloemfontein, Port Elizabeth, Polokwane, Pietermaritzburg and Nelspruit plus many other South African cities. If you would like to use our professional Windows installation on Laptop services but don't live close to our Laptop repair service center, click here for information on sending us your iPad for professional repair through our express courier service. The service price includes installing windows, the latest drivers, useful freeware utilities and software plus any software you have licenses for. By Law, you require to have a genuine windows CD. We DO NOT install copied or pirated software. If you don't have a genuine Software, we will give you a quote for one depending on your operating system option.There is an extra charge if you want your data backed up and returned in your new Windows installation. If your genuine operating system is corrupt or Non responsive, you may not need to purchase another software. 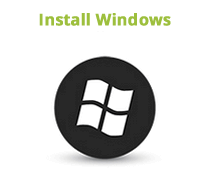 We may use your current licence to re-install the new Windows operating system.